Stalled NXP shares have driven activist investors to push for a larger price tag, and fewer shareholders are voting "yea" with their wallets again. But Qualcomm continues to soldier on. Another month has gone by, and it's time for Qualcomm (NASDAQ:QCOM) to re-up its tender offer for all shares of NXP Semiconductors (NASDAQ:NXPI) again. Like clockwork, the chip giant delivered its sixth tender offer renewal. Here's what you need to know. Data sources: Qualcomm and NXP Semiconductors. So NXP owners have withdrawn 5.5 million shares from Qualcomm's tender offer in June alone. The current count sits 27%, or nearly 16 million shares, below the March peak. The companies are a long way away from the 80% tender offer acceptance level required to close the deal and force the remaining NXP shareholders to part ways with their stubs in exchange for $110 per share in cold, hard cash. As always, Qualcomm reminded investors that the offer will continue to be extended, month by month, until all closing conditions have been met or the entire deal scuttled. The next expiration deadline is slated for the close of business on July 27. Image source: Getty Images, Qualcomm, and NXPI, edited by the author. The dwindling number of tendered NXP shares is likely related to activist investors holding out for a higher price. A group of such investors, led by private-equity firm Elliott Management, started that effort in late May. It's unclear how much of an impact Elliott and friends have made on Qualcomm's buyout strategy. At the same time, those people seem to have a reasonable point. NXP's share prices have been frozen just below Qualcomm's offer of $110 per share since last October, gaining just 7% in eight months. Meanwhile, the S&P 500 market index marched 13% higher and the PHLX Semiconductor Sector stock tracker surged 29% higher. Under these conditions, some NXP investors may feel as if their funds could be doing better in another semiconductor stock. Attaching your assets to a $110 final buyout price when shares are trading at $109.90, well, it's a lost opportunity to make more money elsewhere. Might as well just sell the shares and sit on that cash until further notice if you don't expect any improvement. And at the same time, deals like this one can and do fall apart every now and then. That's a risk for investors, who would probably see their share prices plunge if that news ever came to pass. That being said, Qualcomm is keeping a stiff upper lip, and there are no promises of higher prices. "We remain on track to close the transaction this calendar year, and integration planning continues across both companies," said Qualcomm CEO Steve Mollenkopf on the earnings call in April. The story hasn't changed, nor has the buyout bid. Watch this space for updates on the Qualcomm/NXP merger. You won't miss a beat. 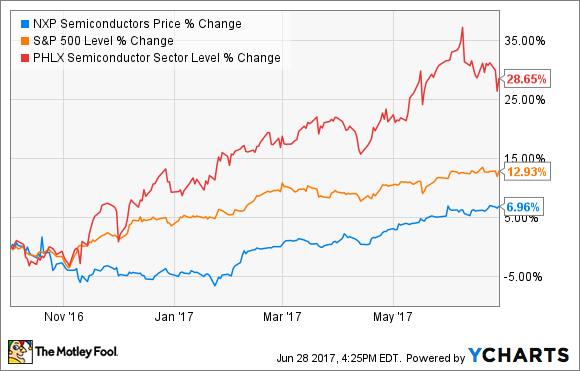 Is NXP Semiconductors a Buy?